Besides providing Peruvian communities with medical care, one of the goals of the MEDLIFE organization (as we have learned during our daily meetings) is the development of the communities we serve. 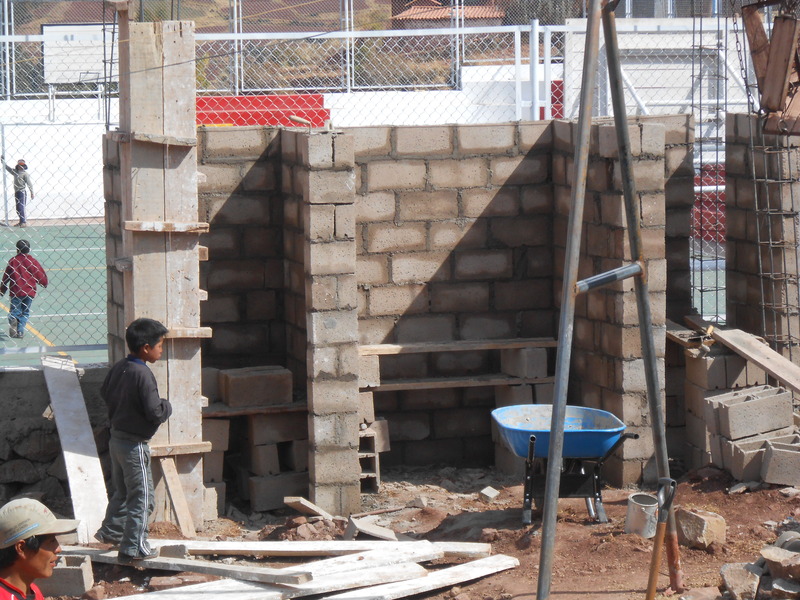 This brigade we have committed to building a bathroom for a school in one of the local towns outside of Cusco. Each day, a small group of volunteers has spent their day at the school wheeling sand and dirt up hills, digging holes, and mixing cement. Tuesday was my turn to visit the project. Our main duties were to shovel a sand and rock mixture from a large pile at the base of the hill the school was on and then wheel that mixture up the hill to the entrance of the school. From their we made an assembly line and passed the mixture down to the actual location of the future bathroom (just outside the classroom) in buckets. After what seemed like a hundred passes of the bucket, we were told we would have a break. Fortunately for us, and our hungry bellies, the teachers and adults of the school had cooked potatoes that they had grown in the town and served them to us with a green sauce filled with garlic, herbs, and more. The combination was delicious, and I can honestly say was one of the best potatoes I have ever had in my life! During our potato feast, the kids of the school were also eating lunch – a mixture of beans and rice. As we finished the meal, we contemplated the rest of the assembly line work we had ahead of us – only to be told that we would now be heading to a farm to help plant corn! When we arrived the farmers were eating lunch, so our visit was limited to multiple death-defying pictures posing with bulls that were suggested by Carlos (the head of Peruvian Brigade prep if I understand correctly). Interestingly enough we were allowed to work with the bulls in tilling the soil for the crops; we followed behind a pair of bulls as they dragged a large wooden spike into the soil. Finally, we finished the day wandering down an old Incan path, where many of us found chunks of pottery and small “treasures”.